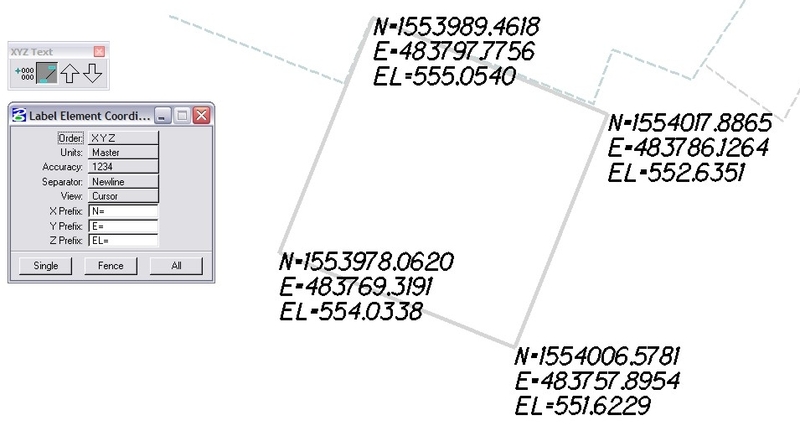 Delivered with MicroStation is a toolbar that will label coordinates in the file and import/export coordinates. From the MicroStation pulldown menu select Tools > Annotation > XYZ Text. Label Point – will label points selected in the drawing. The active text settings are used. 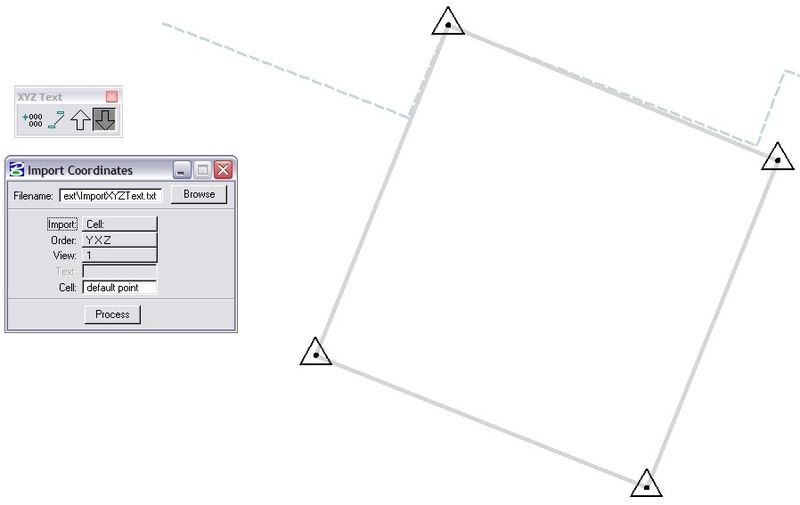 Label Element – will label elements in the drawing. Settings include labeling elements individually, by a selection or fence, or all elements in the drawing. The active text settings are used. 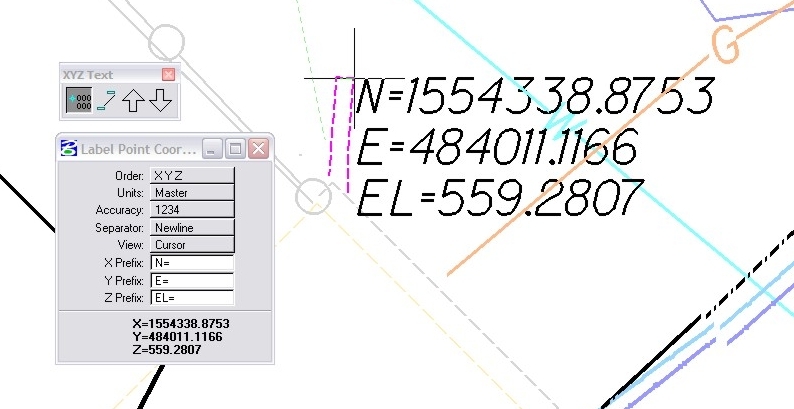 Export Coordinates – will export the vertices of elements to a text file. Settings include exporting elements individually, by a selection or fence, or all elements in the drawing. The active text settings are used to label the point number. 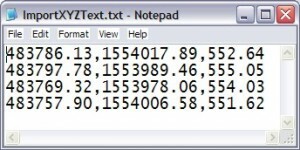 Import Coordinates – will import an ASCII text file into the design file. Settings include placing a active point, text character, or cell at each location. I want to take this example a step further and place the list of coordinates into a table. Should a point move I want it to be dynamically connected to the table so that the coordinate is updated. Nothing native in MicroStation to do that, but it could be done with some macro programming. Is there a way to modify the formatting of the text when it is inserted? Can I change the font, size, etc? The text is placed as a regular MicroStation Text Node element. You can use the Change Text Attributes tool (Tools > Text > Change Text Attributes) to modify the text formatting. 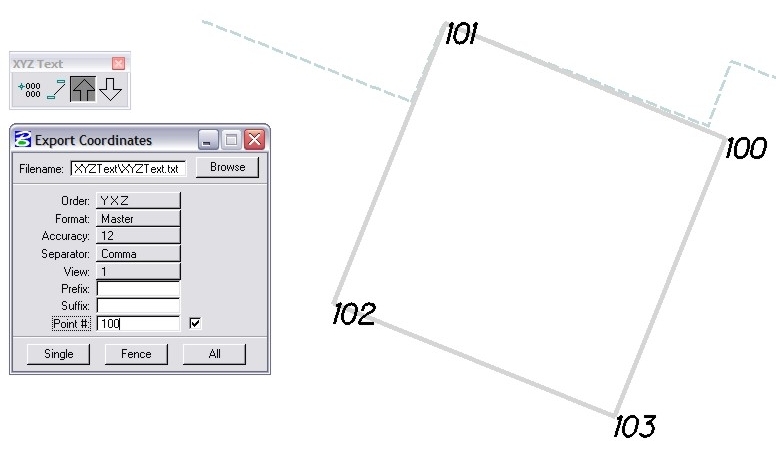 Selecting a complex chain element, then selecting Element Information, then selection GeometrySegments and clicking on the 3dots at the right end of the Segment row causes line segment table to open (with xyz of each line end points with length and bearing)…this can be exported to excel (as a table).